Seesaw. I was raised Conservative but in a kind of just going through the motions way. I never really clicked with Judaism, and it surprised nobody when I married a non-Jew. We had a rabbi officiate our wedding, but not for spiritual reasons. We just liked some of the fun Jewish traditions, and also couldn’t come up with a better alternative, and knew the rabbi would make my family happy. Now I am pregnant with a boy and my family is putting pressure on me to have a bris. I will circumcise him in the hospital, but I just feel no need to have a whole ceremony and party a week after I give birth. The reality is, it means nothing to me and I don’t feel like I should have to do this just for my parents. We aren’t going to raise him Jewish, so there is no point in pretending we are at the beginning. Seesaw, how can I get my parents to understand that I just don’t care about being Jewish? Intermarriage and parenthood are great opportunities to re-evaluate your relationship with Judaism. 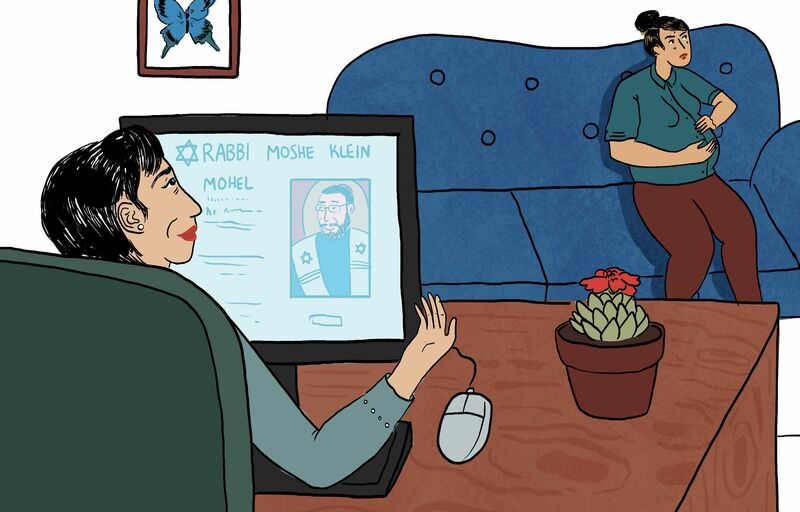 Just because your parents’ Judaism didn’t resonate doesn’t mean that there isn’t another type that could enrich your life. There are more varieties of Conservative synagogues and other streams of Judaism than when you were raised. Instead of focusing your pregnant energy on convincing your parents or rejecting their ideals, use this special time to explore the many Jewish options that exist today. Even if you don’t care about being Jewish, your son may care. Create a meaningful bris experience for his sake. Since you already plan to circumcise him, why not do it at home in the presence of a few loved ones and close friends? It does not have to be an elaborate ceremony nor a full-fledged party. You can design a personal gathering and keep it a casual affair, even a potluck. If you’d prefer the actual foreskin removal be done in private, take your baby into another room. When my daughter was born, I read The New Jewish Baby Book by Anita Diamant to help me devise a brit bat (covenant of the daughter) that felt right in all respects. Years later, when Shira was in first grade, we created a presentation about it for “show and tell” at her school. Had I done nothing when she was named, there would have been nothing to share. Having some foresight is part of parenting. Your child will still be Jewish no matter what you do or don’t do so you might as well give him a culturally significant welcome-to-the-world celebration even if religion per se isn’t the goal. Leave the door open for your son to have a stronger Jewish identity in the future if he so chooses. It may be a point of pride for him that it hasn’t been for you. You won’t regret having a bris; but you may very well regret not having one.